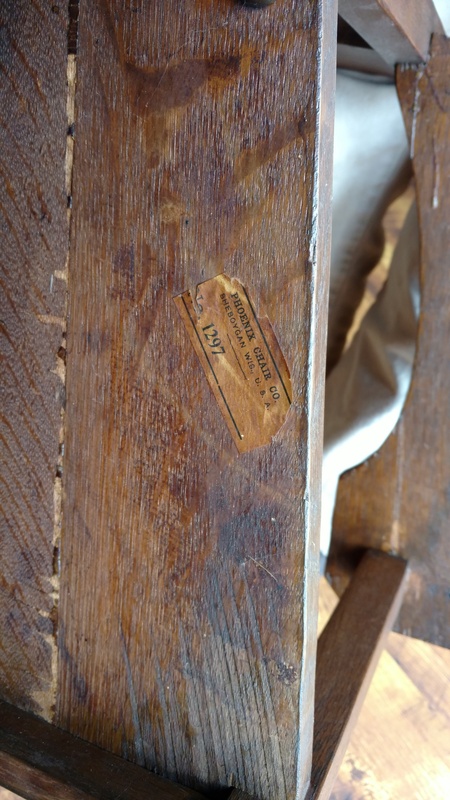 The Phoenix Chair Company was a popular furniture manufacturing company that was founded in the late 19th century in Sheboygan, Wisconsin; (a city which has since been coined as the "Furniture Capital of the World"). The company produced various furniture items such as rocking chairs, armchairs tables, dining sets, cabinets, hutches and much more, and continued to manufacture products up until the 1930s. 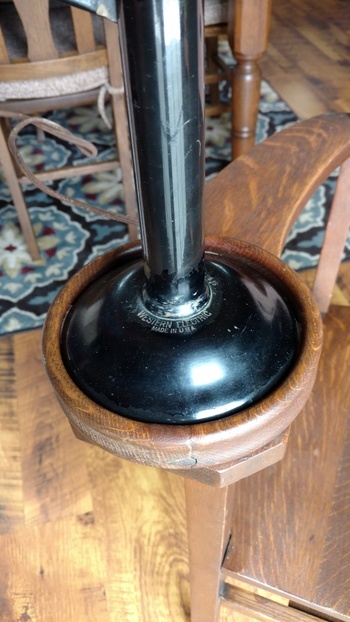 The items were typically made of cane, oak or beechwood, and sometimes their chairs featured a unique design that was influenced by nature as well. The following is from an article in The Sheboygan Press, dated Aug.1, 1978: The descendants of Silas R. Crocker, who with I. V. Bliss, began the Crocker and Bliss Chair Co. in 1866. Silas R. Crocker, who had learned carpentry and cabinet-making in his father's shop, came to Sheboygan with his family in 1853. He was originally employed in a shipyard, and worked on the first dredge used in opening the harbor here. Later, he, with Bliss and a son, Watson D. Crocker, purchased a building known as the Gurrey Hotel on Pennsylvania Avenue to be used as the site for a furniture manufacturing company. The company was in operation for 8 years before being destroyed by a fire in 1875. The loss was total and the firm was dissolved. The Phoenix Chair Company was founded almost immediately afterward by a group of businessmen in the area, and for a time Watson Crocker served as the superintendent there. In 1880, however, the Crocker brothers formed the Crocker Chair Co. The company had 2 large factories by 1894, known as factory A and Factory B, as well as a factory and sawmill at Antigo. The Crocker interest in the company was passed eventually to E. A. Zundel, and in 1924 to Dr. G. W. Brickbauer. The firm went out of business in the 1930's, a casualty of the Depression. Some catalogs are available to view online through the UW Digital Collections. For a smoker, a cool place to put the ashtray!! Still loving it!! fhrjr2, Very interesting. Not quite a twin, but very similar. robertg456, In thinking about this, I being to wonder whether your chair was indeed modified. The picture of the chair at the link provided by fhrjr2 shows that the small circular stand is mounted on a metal support. I don't think either chair was modified, I sooner think it is simply one being a copy cat of the other. 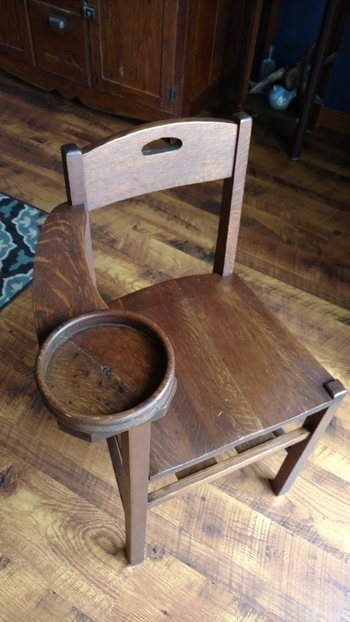 Both chair appear to have been intentionally made with only one arm. One arm chairs certainly exist most notable being the Sword Officers Chair from the days when military officers wore a sword. I would think these are original. 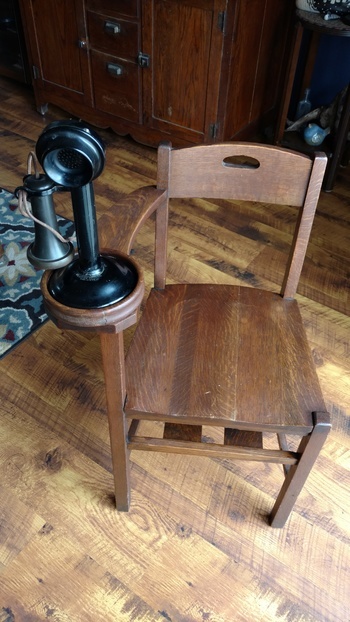 Of course, in my day, one-armed school chairs were quite common, which is what the Phoenix gossip chair, minus the little circular phone rest, looks like to me. 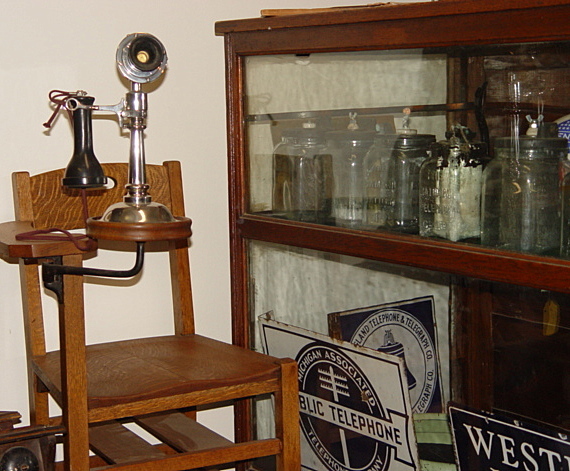 The one with the hinged metal bracket had the added benefit of the ability to swivel the phone aside, when not in use.